Nothing but smiles. Very professional, but also felt like family. Excellent place to decompress and renew one's dreams. Everything we needed right there. Danielle was friendly, knowledgeable, and a pure delight to work with. Our stay was unbelievable! The home was immaculate with a great view, the location was perfect, and there were no issues during our stay. We will definitely be back...and will definitely use Manzanita Beach Getaway again! 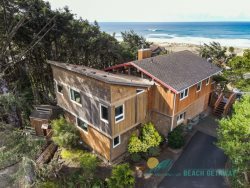 We've stayed at many homes in Manzanita over the years and this was the best! Danielle was great to work with! Loved staying at the cottage. It met our every need, was cozy, clean, and well equipped. The yard was perfect when it was too chilly or windy to be at the beach. My Family and I stayed at the house in June and had a wonderful time! After a day at one of the many beaches nearby, it was great to come back to this oasis and relax. The light airy, open feeling is definitely a huge bonus! It also had a beautiful view of trees and the ocean! Divine! For those not from Oregon, know that the OR coast can be quite chilly even in the summer! Rarely would a house be built with A/C out there. For this house, strategically opening windows and using a fan created a wonderful cool cross breeze in the deathly hot summer heat of (2015). Over all, this is a beautiful, welcoming home in a charming coastal town. If that is what you are looking for, you will be happy here. Love this house! We spent an amazing week in July, 2015. The weather was perfect and the house far exceeded our expectation! The newly remodeled kitchen is beautiful and was well stocked with everything we could possibly need. Lots of windows & light throughout. The deck was perfect for watching the sunset and viewing the ocean. Great separation of space and our teenagers loved having their own space to "hangout". A good location, feels very private and yet it is less than 3 blocks to beach (about 5 min walk). We will definitely be coming back! The best service I've ever had with a rental agency in Manzanita. Very helpful in assisting us in finding the best house for our family on fairly short notice for summer renting. Friendly, courteous and timely. Relaxing, quiet punctuated with the thwack of club on golf ball. I had everything I needed for a peasant stay. Very positive as everyone was friendly and helpful. Wonderful week for all eleven of us! Danielle was great to work with. Had to cancel last year because of a broken water pipe in the home. Danielle made sure we could re schedule for this year and we received a free night because of the inconvenience. Loved the location of the home especially the beach access. Rockaway Beach was a short drive to other places we wanted to visit along the coast. The beds were very comfortable and the amenities were great. The kitchen was not lacking anything. We truly enjoyed our stay. The home is beautifully decorated; warm and welcoming. There was enough space that you could be a part of the group or find some time to yourself. The back deck is a lovely spot for late afternoon cocktails. We loved that the house was walking distance from the beach, shops and restaurants. We will be back. Thank you! Staff was responsive and helpful when we had a problem with the grill. Danielle graciously answered emailed questions leading up to the trip, and allowed us to shift our dates a little. I think it would be very helpful if you gave instruction to your guests about how to recycle! It ended up being more challenging for us than it could have been. Tell people where to take the recycling and how to sort it. We are from Washington, where all recycling is comingled in the can. It was a big hassle when I took our boxes of recycling on our way out of town and I had to sort everything! I didn't know about the 'deposit bottle' concept either. Thank you! The trip overall was amazing and are already planning on staying longer next time. We are also thinking about how we can get back there in the fall. We loved beach time, down time in the house, and exploring nearby parks. We are also grateful that you accepted our sweet dog. We loved the setting and large windows looking out on the trees. It was so serene and relaxing, and a little unexpected for a beach getaway. And the interior decoration is top-notch. You'll often find what looks like left-overs and hand me downs furnishing beach houses, but this cottage was very well-appointed. It was clear that a lot of thought and care went into creating this beautiful space. We loved feeling like we were in a secluded getaway, but the house is just a quick walk to the beach or downtown - very convenient. We were very pleased with the price as well. It was perfect for us - we'll definitely be staying again! Everyone was always very friendly and professional and answered my questions right away. We loved Westover and would definitely stay there again. The house was very comfortable and had everything you could need in the way of ammenities. The beds were comfortable and the linens were nice. We really enjoyed our stay. The kitchen was well stocked too. A few things you might want to know though the two patterned chairs in the living room by the front door are wearing out. They aren't very comfortable to sit in for very long. You can feel the bar in the bottom of the back. Also, we were told the couch in the loft was a sleeper sofa and it isn't. You might want to tell your folks that. Also, there's only one ping pong ball for the table downstairs. It would be nice to have more. And in the rules you require that all trash fit in that one bin outside or we have to take it with us? That seemed a bit excessive. I wanted to let you know that the bin was almost full when we got there and we had to leave it with several bags of trash even after the trash man came. Can you get another bin? That seems like it would solve the problem. Asking your guests to take trash with them certainly isn't the answer. No problems, very pleasant and helpful! It was one of our best vacations ever! Would love to come again! I kept emailing our questions as we got nearer to going and always received a quick friendly response. Everyone loved our stay! The weather was perfect, fireworks on the beach can't be beat! The view from the living room and upper deck was breath taking! They are awesome and amazing folks to work with!